Hall’s Jumbo mini Greenhouse placed on the terras of Viller the Garden. In February I started to sow annuals and some perennials. In order to grow them to healthy young plants I ordered an extra cold frame to accommodate them all. Today I potted up some seedlings and placed them in the old cold frame with the slanted roof. Yet the fast-growing annuals like snapdragons and Cleome’s are housed in the slightly higher Halls Jumbo. 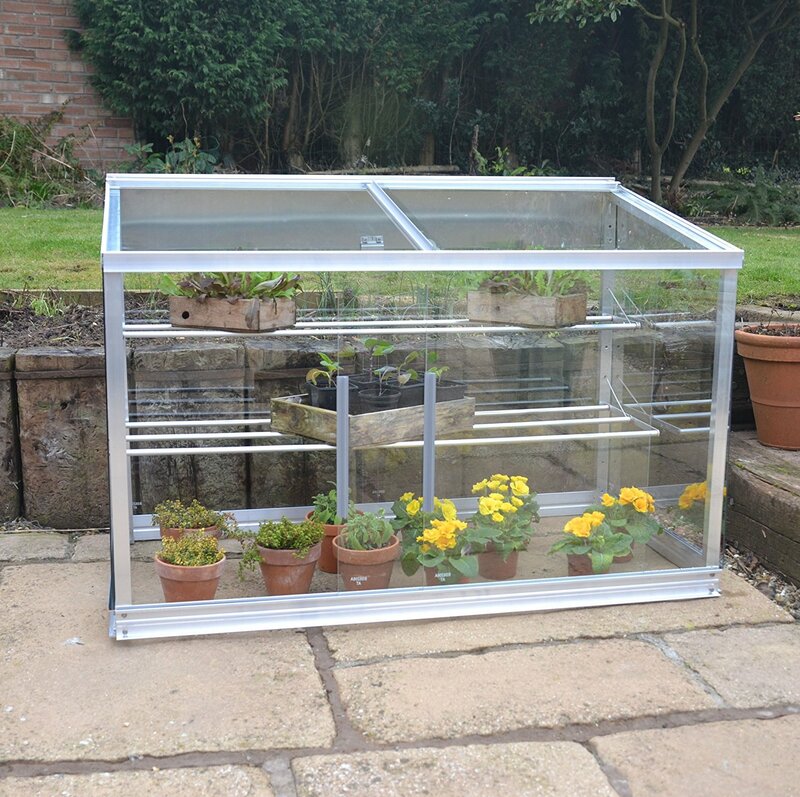 Hall’s Jumbo mini greenhouse has an aluminium frame with real glass which is a far better choice than a polycarbonate model. Since polycarbonate (plastic) is prone to scratching and will become cloudy over the years (become yellow). 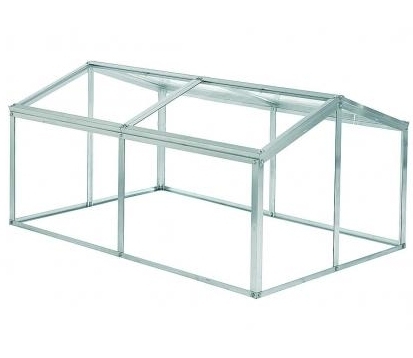 Therefore Hall’s Jumbo mini greenhouse is a nice sized cold frame with glass panes which is packed in a heavy flat-pack but is easy to assemble. Its dimensions are: 129x87x60cm(middle). Plastic is in my opinion not a noble and ecological material and should be banned from your garden. So it is a pity that you can’t buy glass cold frames in the States and the same applies to Germany. Therefore the only possibility to have one is to make it yourself. I hope that in the near future someone across the ocean and here in Germany can inform me when a nice glass cold frame is available. 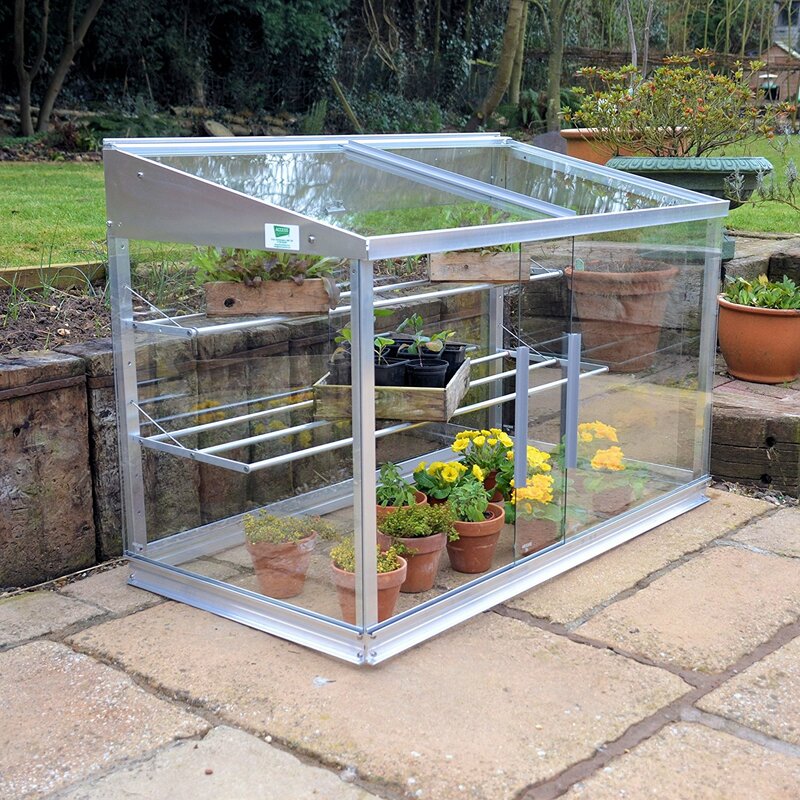 Maybe it is possible to import the lovely cold frame from Access Garden Products. A nice feature is to open the front and top panes slide for easy access and ventilation. 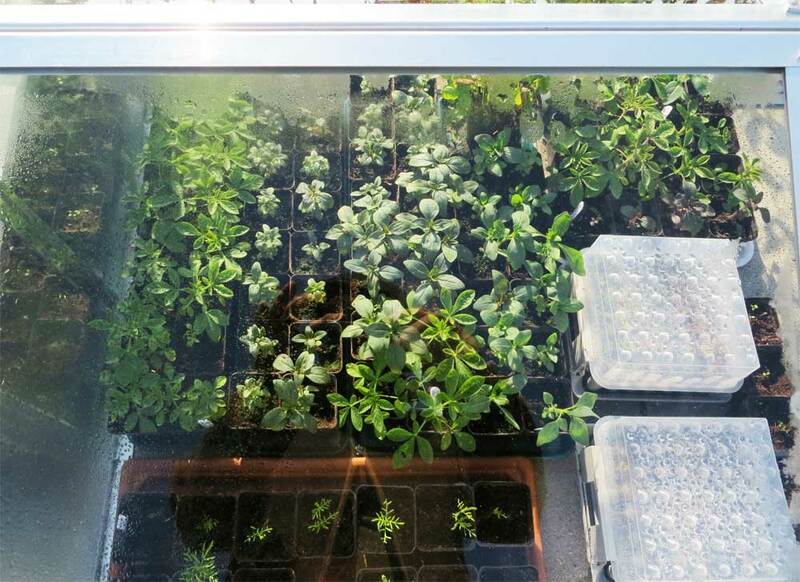 in springtime the two seed tray shelves are very handy to grow up your seedlings. When you take them away you can store large plants up to 82 cm to protect them from the freezing cold. Its other dimensions (121 x 65cm) makes it possible to place a lot of plants.